Mr. Mike's are a plumbing, heating and water treatment company based in Calgary, Alberta in Canada. From domestic to commercial, we put a great emphasis on providing a reliable and trustworthy service. Our retail maintenance side of the business is rapidly expanding with more and more companies enquiring about and approving Mr. Mike's Plumbing . We put this down to the fact that the whole procedure from start to finish is dealt with immediately and proffessionally. All risks assessments are available with approved COSHH sheets and Health & Safety Policies. Each assessment is bespoke to that particular service provided, for larger projects and installations meathod statements and all relevant legal legislation is prepared in-house. As we all know the majority of plumbing problems usually occur at the worst times, late at night or on weekends. At Mr. Mike's Plumbing we have a system designed to cater for any problems any time of the day or night. Our office is open 24 hours a day and the phone is always answered. We have a materials store which is also open around the clock 365 days a year and is fully stocked with plumbing materials for any type of household problem. All our prices are prefixed and are agreed with the customer before the work is carried out. Our prices are very competitive and are below the regional average. All work is fully Guaranteed and discount procedures are in place, such as OAP discounts. We aim to respond to every emergency within two hours and at present have a 98% success rate. There is a great emphasis on ensuring that water supplies are safe for the end user.. Certain areas of concern have been addressed by the local authority and government agencies. Mr. Mike's Plumbing plays an important role in ensuring plumbing supplies,pipework and water storage tanks are clean and free of harmful bacteria in accordance with Acop L8. On new plumbing and pipework installations it is generally considered good practice to have the pipework thoroughly disinfected, chlorinated. This reduces the risk of infection being passed to the end user from substances used in the installation and from any bacteria that is present in the pipework or water. 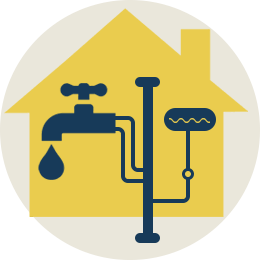 With the growing concern and more and more outbreaks of Legionaires desease as a result of poor water supplies Mr. Mike's Plumbing offers a legionella testing service with recommedations of preventitive measures. Again due to current legislation many customers are requiring heating systems thoroughly cleaned either by powerflushing for domestic customers or higher grade chemical cleaning for the industrial sector. Mr. Mike's Calgary Plumber offer a full heating system chemical clean flushing service from a small domestic system to Larger plant room variable zoned systems. For our commercial sector commision reports and analysis of levels such as psuedomas tests can easily be catered for. Mr. Mike Calgary Plumber is able to carry out various bathroom and heating installations. From a small bathroom suite swap 'like for like' to larger bathroom suite installations including tiling ,plastering and carpentry. Our suppliers have a wide variety of different style bathrooms from classical to contemporary and at realistic prices. Whatever the customers requirments we feel we can deliver with no fuss. Our hard working teams of multi-trade fitters ensure that we can install bespoke bathrooms whatever the design. Many of our customers have trouble visualising what they want, with our proffessional design service we can ensure that the customer gets what the customer wants. For larger installations such as bathrooms/heating in flats/offices, public houses or hotels, Mr. Mike's Plumbing can carry out these projects no problem. Supply and fit projects are a speciality with specifications being drawn up by our experience staff to suit any project. Our experienced fitters are able to install any variation of heating system from your basic boiler set up to your more complex technical style plant room. With a full mechanical team any project can be dealt with.